Beer is good. Fathers are good. A post about excellent collaborations. Fathers don’t always want ties for Father’s Day. They don’t always want breakfast in bed. Dads don’t always want power tools for their birthday (unless of course they are cooking geeks and want a cold smoker — ahem, Jack, you get the message there, buddy. Notice the link.). It is true, however, that dads like a good beer. OK, even that isn’t always true. But it is true of this father on his second Father’s Day. That is why I’ve decided to make a pair of recommendations to all you folks looking for something for dear old Dad. So, a couple of years ago, Garret Oliver — brewmaster of Brooklyn Brewery, beer luminary, and Slow Food guru — had a moment of mutual admiration with Hans-Peter Drexler, brewmaster of G. Schneider & Son of Germany. The American loved the wheatbeers of the German. The German loved the hoppy beers of the American. And in a Reese’s Peanut Butter Cup moment of brilliance, they decided to combine efforts. Their joint venture became these two bottles of beer. 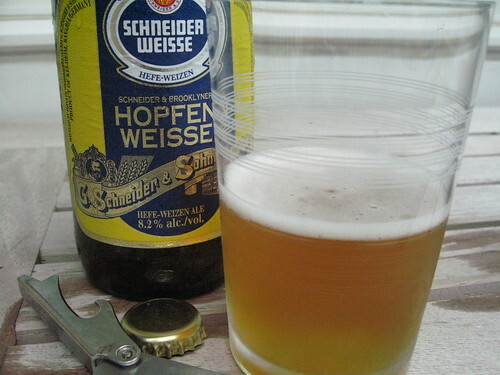 While using essentially the same recipe, they manufactured two distinct beers. 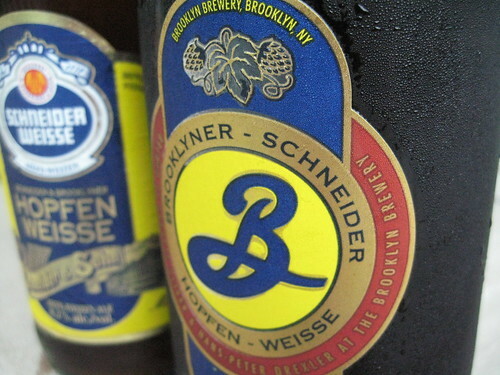 Brooklyner-Schneider is brewed here in the States using American hops and Schnieder’s yeast; the Schnieder-Brooklyner is brewed in Germany using local hops and Brooklyn’s yeast. 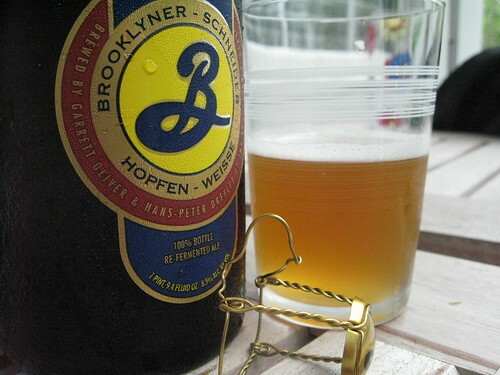 The result is some of the most delicous beer I’ve had. Both are snappy, with a myriad of flavors like banana, but with high acidity. These are perfect beers for lighter summer fare or even richer barbeque food. They are also spectacular for sitting and drinking on the back porch after the kids have left the house or gone to bed. Either beer would make an excellent gift for a Dad. I tend to favor the Brooklyner, the wife seems to favor the Schneider. So, have fun and pour both to decide for yourself. This is the second year of this collaboration, and the beers are available only in limited quantities — so they may be difficult to find. Try your local beermonger. Finally, in the last food post, I mentioned a pairing for the salad with some great craft beers. I also felt a little self conscious because I gave such light beers my first nod. So I feel the need to prove my manliness and my growing understanding of beer. Yes, real men only drink dark, monster hopped IPAs and Budweiser. Well, OK, I don’t drink like that. But I’m a man, dammit! I’ve a son to prove it to! As a result of this need to prove my manlihood, I’ll occasionally make suggestions for pairings of beer and food. I’ll also drop a post now and then about something exceptional I’m drinking. We aren’t going to become a beer blog; there are better and smarter guys doing that sort of writing. Instead, we like to think of ourselves as being about the food and the joyous event of sharing time with people. I hope you enjoy this new twist. Also, if you’ve got insights and suggestions on things that you are drinking, we’d love to incorporate them. So, if you don’t have a chance to sit down and pour your Dad a beer, and/or sit down and share a meal with him, I hope you call him on Sunday. Top Chef Week 14: The End! And it’s over. There were tears of joy, tears of sorrow, tears of bitterness. And finally, a winner. But first, the cooking and the parade of celebrity chefs come to get their grub on. Perhaps unfairly, three of them actually had to work for their suppers. Yes, as our finalists stood before the requisite folding tables heaped with food, they were confronted with three big name chefs who would become their sous: Le Bernadin’s (dreamy) Eric Ripert, Blue Hill’s Dan Barber and the Spotted Pig’s April Bloomfield. The final three could choose their sous chefs and the corresponding ingredients that came with them — but it seemed a little more like a popularity contest: the arguably biggest name chef (Ripert) went first to Stephanie, followed by Dan Barber to Richard and April Bloomfield to Lisa. Now, armed with ingredients and high-wattage talent, the three finalists had to craft a four-course “meal of a lifetime” to see who would be the next Top Chef. Perhaps most surprising? Lisa and April actually hit it off. Indeed, working harmoniously (for once), Lisa crafted a menu that drew on her Asian training. The first course (from what we remember) was spicy shrimp, the second was a coconut soup and dumpling, the third course was beef wagyu and her requisite dessert was some sort of black rice concoction that intrigued the judges. Stephanie (awesomely) took Eric Ripert to task on his fish filleting skills, while also coming up with a menu that featured her interest in simple, but varied, flavors. Her first course was a soup with a “perfectly cooked” snapper, her second course was a quail breast over lobster ravioli and her third course was an unorthodox combination of lamb with mushrooms, blackberries, tampanade and braised pistachios. Her final course was a ho-hum ricotta pound cake with bananas. Richard, looking pretty panicked the whole time, didn’t get much screen time with his sous chef and seemed to keep his menu in flux until late in the game. In the end, he produced a menu that was, apparently, “overthought” and under-executed. (But he did wow Ripert with his liquid nitrogen antics.) His first course was a simple scallop with fruit, his second course was a play on “which came first” featuring a chicken egg, fois gras and guinea hen, his third course was a not-too-crispy pork belly with pickled radishes and his dessert course was a cheeky bacon ice cream with banana scallop. Cut to shots of food-world glitterati stuffing their faces. Perhaps the only drama of the night came when the judges continually praised Lisa’s meal. Shock. Horror. Could the much reviled Lisa actually win this thing? Indeed, throughout the judging, Stephanie and Richard looked like they might vomit from nerves… while Lisa, who usually looks like she wants to take an axe to the judges, actually looked kind of friendly. Then favorite Richard sputters out an “I choked” when asked how he thinks he did. What is happening, Top Chef? At last, the judges relieved the tension wrought during the last ten minutes of the show… Yes, a woman is Top Chef — but it is not, in fact, Lisa. Stephanie, you go girl. The all new Top Chef, now featuring girl power. Congrats! Q: What celebrity chef would you choose to be your sous-chef? Husband: Gordon Ramsey might throw a knife at me. Thomas Keller would require me to sit in the corner and practice until I got it perfect. And Emeril Legasse most likely would douse everything I made in his essence or parsley. So, I want someone like Charlie Trotter. He’s frighteningly intense, and he used to be a former gymnast so he can work the tight corners in the kitchen. But he looks like a little guy, so I might be able to take him down when he wasn’t looking if he got too out of hand. Otherwise, I might need Eric Ripert or Daniel Boulud. At least, they look like they might have a good time working. Q: Was requiring dessert fair? H: No. I know they’ve done more to emphasize the dessert skills this season. But none of these folks are pastry people. The desserts they made were not impressive desserts. If you go to fine dining and see refined desserts, they are little pieces of edible art these days. All three of them made variations on warm, comforting dishes. While there might be some Top Chef types who could hold their own with dessert, it shouldn’t be a required skill. On its best days, it would be like lining up three sports cars next to a nice looking sedan. W: Yes. If I were a judge, I’d want to eat dessert — and those contestants have to do what I say! Plus, if you’ve watched the show and have any sort of game plan, you’d know that making dessert is likely to be required. Hello? Practice, practice, practice. I’ll even eat your failures. Q: The Zagat guide is known for its three criteria and 30-point scale. So in honor of Tim Zagat’s presence at the final dinner, what would you give this season of Top Chef? H: 19 for story. There were times I was a bit bored this year. While I appreciate them appearing to be more serious about the food, it would have been nice to have at least one attempted assault with shaving sheers to make the blog entries funnier. 20 for contestant demeanor. We’ve come to accept that odd people want to work in kitchens and odder people want to be on Top Chef. Unfortunately, Lisa of the bad attitude was the worst we got. And compared to Flavor of Love, these people seem almost normal. Finally, 29 for product placement. They were so close to a perfect score. If they had just mentioned Toyota one more time… perhaps one stuck in a Glad garbage bag stuck in the bottom of the harbor in San Juan. W: What this show needs a Christian from Project Runway. That kid had talent and personality. Plus, he had hair that would shame these Top Chef contestants’ meek little faux hawks. So I have to give Top Chef a 15 for personality and hair. Pretty mediocre, Top Chef. If I was rating food — a la Zagat — I’d have to give Top Chef a 20: It all looks really yummy, but so far I have yet to taste anything but the glass on my TV set. And finally, I have to give Top Chef a 30 out of 30 for girl power. It’s about time a chick won. Go Stephanie!! What is your score for this year’s Top Chef? And did you also think Stephanie might throw up during judges table? It’s hot here. Brutally hot. The kind of hot where the scorching seat of your car can inflict third-degree burns and the sidewalk can literally cook eggs. It’s too hot to venture outside. It’s too hot to move. It’s almost — dare I say it — too hot to eat. Wait. It’s never too hot to eat. Of course, at times like these you do have to be very discerning about what you eat. That’s why my husband has cooked up — all caps, here – a REFRESHING salad that reminds the eater that no, it won’t always be 100 degrees outside, it will get better… and why don’t you go to the pool or something. 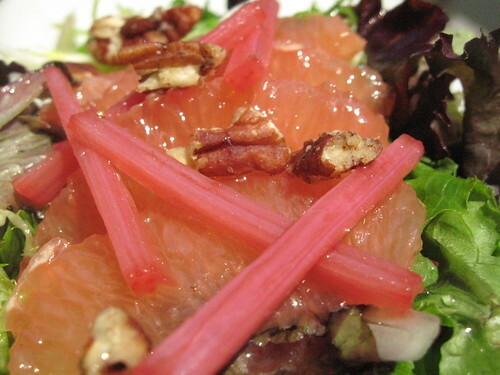 Yes, his rhubarb-grapefruit salad does speak that eloquently to me. It is light and (it bears repeating) refreshing, with a delightful sweetness from the cooling grapefruit and crunchy rhubarb and a wonderful twang from the zesty vinagrette. Plus, that beautiful heap of greens hides shredded mint to further cool your taste buds… and the whole thing is just plain gorgeous. Sure, it’s hot outside — but at least the salad I’m eating is cool. Well, the wife is right about the heat. When I got in my car today, I saw something I didn’t think was even possible. I looked down at the dashboard where it displays the temperature and saw three numbers: a 1 and a 0 and another 0. That’s right: One hundred degrees here in the US capitol. It was the empirical evidence of what the last four days have been — HOT. A stifling hot. The kind that, unless you have been trained in Arizona for several years, you are unlikely to survive if you go outside. The kind that makes you sit in your air conditioned house and not want to move for fear that any slight twitch of friction might cause the trees outside your window to ignite. But even with triple-digit heat, you still get hungry. The solution? Cold recipes. Something refreshing to keep the minions happy. This salad is all about being cool. While there is a stove component, you can do even those parts over a grill. Or you can bear 10 minutes of high heat. Now to the brass tax on this recipe — there are a lot of little things going on. First, you have the poached rhubarb. It is cooked lightly in a sweet syrup of sugar and grenadine. Second, the grapefruit. 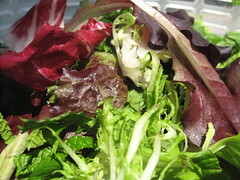 It becomes the backbone of the salad through the tartness of its flesh, and its acidity in making a vinaigrette. Third, the greens. They are a combination of spring greens and herbs to give brightness. Fourth, syrups. 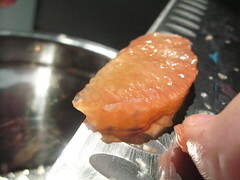 Simple syrup is used to keep the grapefruit from becoming too tart, and a ginger syrup adds a bit of zing. Finally, there is a little bit of pecan to give you that deeper flavor and savory sensation that would traditionally be associated with a cheese (which has been omitted since dairy and 100 degree temperatures don’t mix). Finally, I want to suggest a pair of perfect drinks for this. When we came back, my wife mentioned my growing love affair with beer. And the past few days, I’ve had reason to enjoy the pleasures of beer. So my suggestions to pair with this are two fruit-influenced beers. First is Abita’s strawberry harvest lager. Enough subtle strawberry to match with the grapefruit and rhubarb that you get a nice fruit flavor. Second is Unibroque’s Ephémère. This beer is fermented with apple juice and then flavored with classic orange peel, coriander and allowed to develop slightly bready character by being bottled with its yeast. Both these beers are delicious and dry (meaning not sweet…). By the way, let’s not go into the fact I chose such light, delicate beers as my first recommendations. It’s hot enough without my manhood being questioned… just wait until the red meats and I’ll show you! 1. 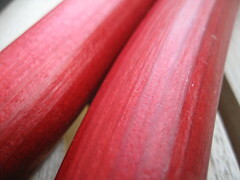 Prepare the rhubarb according to recipe below. 2. Prepare the syrup. In a medium-size sauce pan, combine the sugar and water over high heat. Once the sugar has melted completely, pour half out and set aside. Return the other half to the heat and add the chopped ginger. 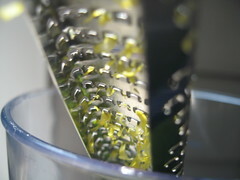 Bring the sugar water to a boil until it starts to form tight bubbles and thicken into a syrup. You are looking for something the consistency of maple syrup. Remove from heat, let cool. Once cool, strain the ginger out, and cover or place syrup in a bottle. The ginger syrup should keep refrigerated nearly indefinitely. Both this and the rhubarb can be done a day in advance easily. 3. Supreme the grapefruit. 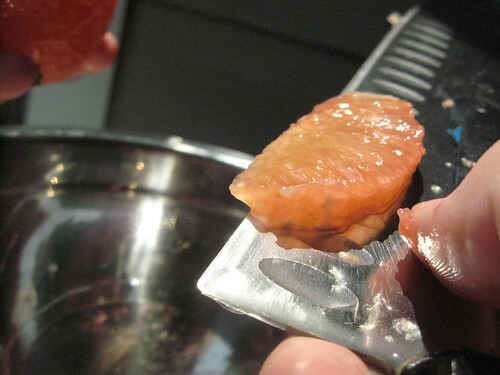 Using a sharp knife, slice the top and bottom of the grapefruit off just until you reach the flesh of the fruit. Slicing along the shape of the fruit remove the pith and skin of the fruit. This should leave you with just the juicy flesh. 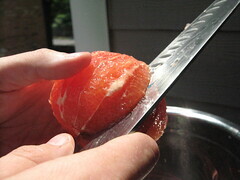 Working over a bowl, cut along both sides of each membrane, removing the grapefruit segments. Allow the juices to collect in the bowl and place the segments in the unflavored sugar syrup you set aside earlier. Once all the segments are removed, squeeze the remaining fruit over the bowl to extract the last of the juice. 4. Make the vinaigrette. 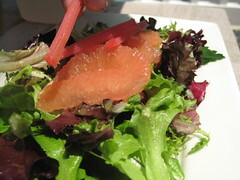 Whisk together the reserved grapefruit juice with two tablespoons of extra virgin olive oil. And salt and pepper to taste. 5. Wash and dry all the herbs and lettuce. Toss together. 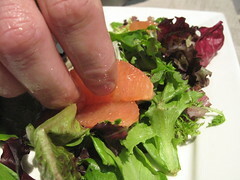 Then toss gently in a little of the grapefruit vinaigrette. Place on a plate. 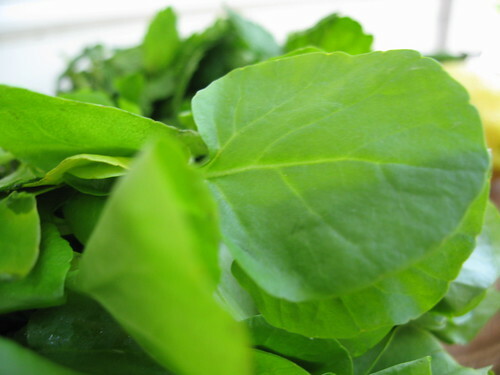 Make sure you have a decent amount of frisee, this is what will give your lettuce height. 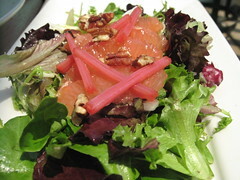 Layer with some grapefruit segments, rhubarb batons, pecans, and then gently drizzle the ginger syrup lightly over the salad. Note: This is based on a recipe by Heston Blumenthal. You can find it printed in the Times here. Furthermore, this recipe makes more rhubarb than is needed for this recipe. However, I found them a delicious sweet/tart snack, so I didn’t make any alterations to the amounts in this recipe. 1. 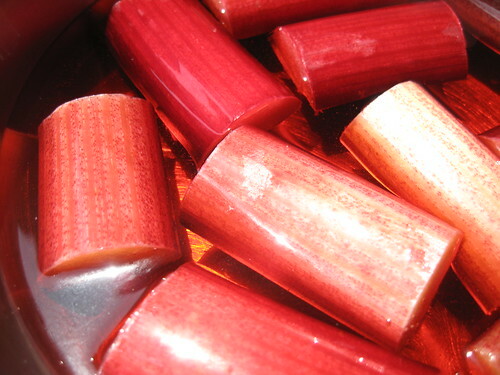 Clean the rhubarb and cut stalks into 2-inch segments. Make sure you discard any leaves of the rhubarb. They are poisonous and can give you a nasty stomachache. 2. 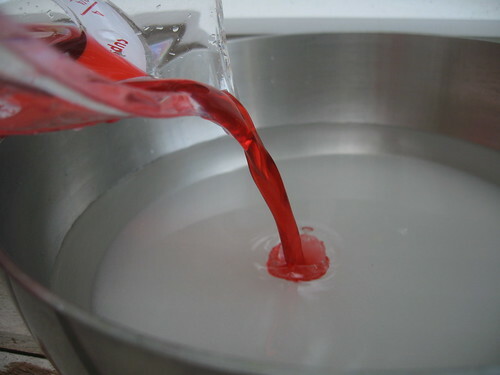 In a medium-size saucepan, add the water, sugar and grenadine. Bring the water to 65C/150F. Add the rhubarb, shut off heat, and let sit for 15 min. 3. 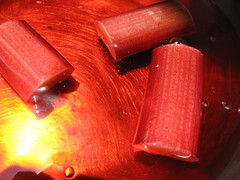 Pour rhubarb and liquid into container and refrigerate for several hours. 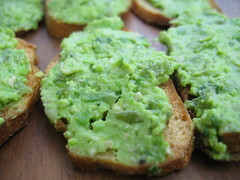 Thoughts on Baby Food or Pea & Mint Crostini? I think we can all agree that food resembling baby food is generally unappetizing. Take, for example, jarred mashed peas. Greenish gray, strained yet lumpy, smelling vegetal and yet not fresh… baby food peas are, well… gross. That is why this recipe is such a conundrum. 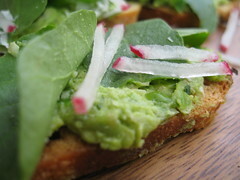 Yes: The fresh, vibrant, and delicious mixture atop that golden, crunchy crostini is, in fact, mashed peas. But this is no baby food (although our baby did devour it). It is a delightful romp through an English garden in spring. 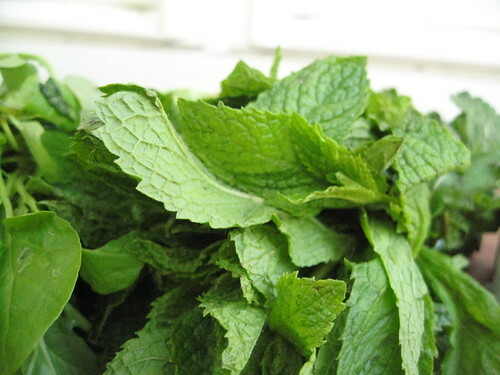 It is a refreshing taste of green with a hint of mint that draws your mouth into a smile. It is all other kinds of food haiku that I can’t quite put into words. 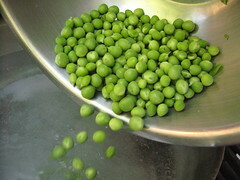 Those meddlesome peas turn out to be absolutely delicious when shelled and mashed fresh out of their pods. Then my husband enhances them even further by adding a kick of a mint and a hint of lemon. Next, he adds an amazing crunch by spreading them over a piece of golden french bread, drizzled with a little extra virgin olive oil. And finally, he make the whole thing dazzling by adding the peppery bite — and visual flair — of a watercress salad. It’s true: I’ll never look at baby food the same way again. I had the pleasure to be in Chicago a few weeks ago. The negative was that I was alone — no Jack and no wife. The positive was that I was in Chicago — and I was hungry. So, I had to eat. As a result, I had the good fortune to escape one afternoon to Avec in the West Loop. I had some inspiring food while I was there. Avec’s food focuses on the Mediterranean regions of France, Spain and Italy. Most of the menu is designed to be shared communally, with small and big plates — all of it served in a hip little wood box of a room. Visually, it reminded me a lot of New York’s Momofoku, complete with its three-man kitchen serving at the bar. Now, we don’t do restaurant reviews here… so the question is: Why am I going on about this place? Well, I like to give credit. This dish was inspired by my meal at Avec. I wanted something simple and light to go with a heavy and spicy dish I’d ordered. The waiter insisted that I try Avec’s pea crostini. Now, I’m a new father. I’ve served my son a good amount of pea purée in recent months and I’ve had some exposure to mashed peas from a container. 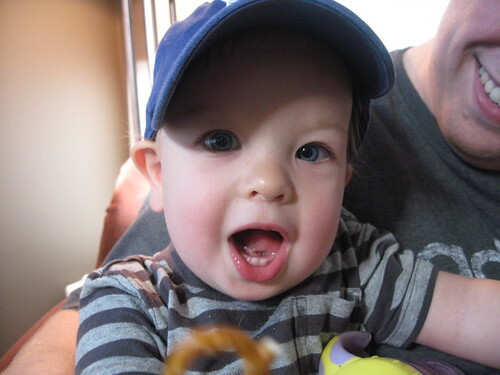 And let’s just say… I wish I was a better father and had spent more time preparing homemade vegetables for my son. So, I was hesitant to go along with the waiter’s suggestion. The recipe here is a quick one. Once the water is boiling, this dish can be on the table in 15 minutes. 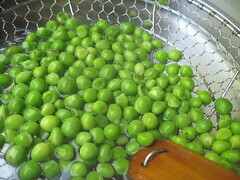 You can even boil the peas in advance and refrigerate them for a couple days. 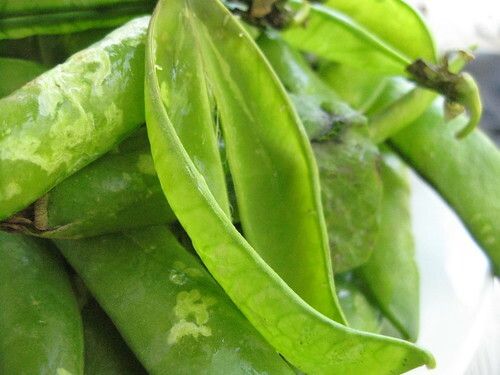 Just don’t blend them before you’re ready; even with the lemon juice’s acidity, pureed peas will turn an unappetizing brown by the next morning. The only slightly unusual ingredient here is ricotta salata. This cheese is made from the same curd of ricotta, but it is pressed and dried. It has a relatively neutral flavor, is shockingly white and has a texture similar to feta, but without the gamey quality of sheep or goat’s cheese. I can find ricotta salata at high-end grocers like Whole Foods or at independent cheese mongers. 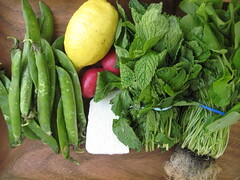 In the end, the cheese adds very little in flavor because the mint, lemon and peas dominate. But its shocking white was a great aesthetic choice, so I used it. I think it makes very little difference; so, substitute away! 1. Salt water until it tastes of sea water. Bring to a boil over high heat. Add the peas and cook for 6 minutes. 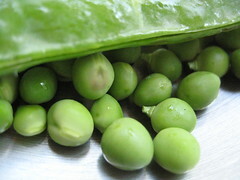 The peas should be soft in the mouth — overcooking is not a negative. 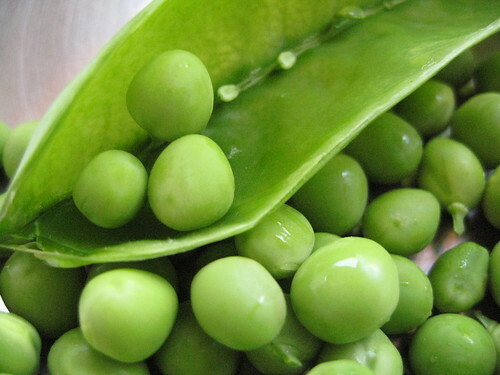 Strain the peas and shock in an ice bath to stop cooking. 2. Slice the bread into thin discs, brush lightly with olive oil, lightly salt, and toast. 3. Combine the lemon juice, zest, peas and mint and then blitz with stick blender. The texture should be paste-like, similar to baby food. Season with salt and pepper to taste. 4. 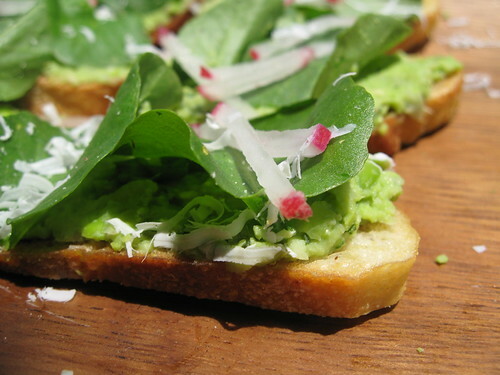 Spread the puree on toast, then garnish with leaves of watercress, slices of radish and grated ricotta salata. After a few months break, our four intrepid contestants reunited in sunny Puerto Rico for the penultimate episode of Top Chef. Little had changed, except Lisa had also joined the ranks of “Top Chef contestants sporting spiky hair” (whose membership continues, disturbingly, to swell). 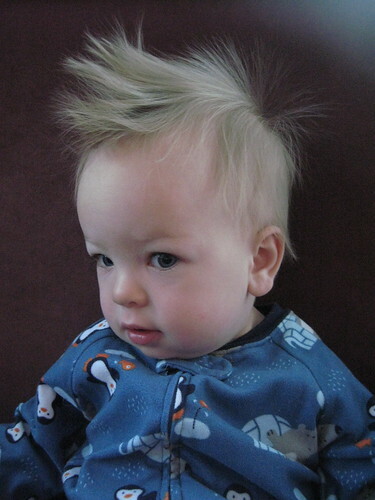 Even our infant son has gotten in on the act: You can see him sporting “the Blais” (au naturel) below. But we digress. The Quick Fire called on the contestants to take on a Puerto Rican favorite, frituras (aka fritters) and use the ubiquitous plantain in their dishes as well. Richard stumbled on slimy raw bananas in his salsa, as did Antonia in her plantain jam. Stephanie, looking relaxed and confident, and Lisa, looking smug and prickly, rose to the top with their superior tostones (fried green plantains). Ultimately, Stephanie took top prize and won the honor of assigning sous chefs for the elimination challenge. What is astonishing, however, is that anyone could cook with guest judge Wilo Benet staring them down. Yes, Wilo is a frightening Tom Colicchio doppelganger without a soul (patch). Some may criticize: “What? Do all bald, pale, portly, middle-aged, white male chefs look alike to you?” And we answer: “Um, yes. They look like freakin’ twins.” Top Chef producers wisely kept Gail and Padma sandwiched in between the two Mario brothers, but to little avail. We viewers were continually confused and disoriented by the surplus of bald, white, male judges on the panel. Anyway… Despite declaring that she would team sous chefs and chefs to ensure a harmonious kitchen, Stephanie paired Lisa with her nemesis Andrew, while pairing herself with Dale; Richard with Spike; and Antonia with Nikki. The challenge? To butcher an entire pig and create at least three dishes using local ingredients. And while a few sparks did fly between Lisa and Andrew, the drama really came when Dale left Stephanie’s pork belly out in the kitchen all night. Where it’s hot. And where pigeons (apparently) live. Stephanie wisely chose not to serve the tainted pork belly, and she and Dale cooked up an ultimately popular alternative third dish of fruit salad with chicharrones (crispy pork skin). After guests of the Puerto Rican first lady had dined on their dishes and the judges and savored their flavors, the winners were declared. Richard and Stephanie (natch) were tops, with Richard taking the prize for his restrained and simple pig fare. And what was his prize? (Insert Price is Right voiceover) A NEW CAR! His confused and surprised reaction said it all. Hello, Richard, don’t you watch TPIR? You’re supposed to lose your mind when they throw you the keys. By process of deduction, Antonia and Lisa were deemed the losers of the challenge. Antonia’s rustic dishes were underwhelming and ran together on her single-service plate; also, her pigeon pea beans were woefully undercooked. Lisa’s Latin offerings were patchy, her plantain puree was cloyingly sweet, and she committed other unnamed offenses. Who would be kicked off? Well, according to Bravo’s phone text challenge, 91% of viewers thought Lisa should be. Hmmm, say the Top Chef producers. In that case, fan favorite Antonia gets the boot. Yes, the tearful farewell was very heartfelt — and the corresponding spike in dislike of Lisa predictable. But those producers are wily… before the door could even hit Antonia in the backside, Lisa had stirred the drama pot by acidly asking Richard and Stephanie where her congratulations were. 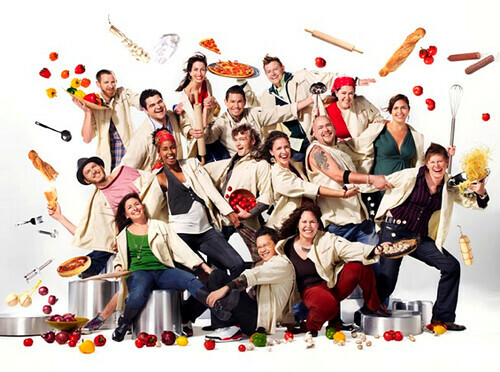 The muttered, “Congrats,” can only whet our appetites for the Top Chef finale. What will they cook up next? Q: In dramatic fashion more in line with an episode of CSI: Miami, the judges revealed the dead body of… a pig? And not even a big pig. And then the trained chefs cringed, but the question really is, are you afraid of the dead pig? Husband: No. I like the pig. In many places, including a couple I worked at while in NYC, you stroll into the meat walk-in and there it is: Old Porky hanging upside down, waiting for minions such as myself to take sharp blades to its flesh. There are so many useful parts out of one pig that there is little limit to its potential — if you have the space and time. Also, it’s delicious. I can point to many postings on this blog to verify this belief. W: I’m not afraid of a big dead pig; I readily consume portions of dead pig on a regular basis. Now, could I butcher said whole animal? Not on your life. Not even with a road map and a sharp knife. Q: After her most excellent pity party, the big question: Is Lisa insecure or simply cocky? H: Well, I’ll be nice. Richard had the best line of the night with his statement, “Congrats for winning the f—ing bronze medal.” In a four man race, when you finish third, you aren’t exactly tearing up the track. So, my feeling is she is insecure. She knew she wasn’t well liked, she knew she screwed up. Her survival was only a surprise because the judges spent a huge amount of time on how bad her dishes were. Therefore, she was lashing out, trying to fine some refuge. Though, the teaser for next week has her claiming to kick Stephanie and Richard’s butts. So I’m probably wrong. W: It’s possible she’s insecure; aren’t we all? Maybe this was a crazy strategy to get them to like her. Something like, “You guys are so mean for not saying congratulations… now feel guilty and like me better.” Despite my attempts, I have yet to crawl inside my TV — much less the minds of the people on it. Q: So, if you are Richard, in this time of high gas prices, would you take the car, trade it for a Prius, or hope for a cash deal? H: Cash. He lives in Atlanta. Traffic is nearly as bad as here in DC. And he uses all those culinary chemicals so I’m not sure the Prius will help his standing with the environmentalists. W: Keep it. It’s a Toyota… it will run forever. Q: Who’s going to win? H: Richard. I’ve a feeling he’s got more toys than neon green tape. And toys are fun. W: Stephanie. You go girl. Who is your winner? What do you think of Lisa? And what was with that dramatic pause at the party — Padma was dancing, then slow motion followed by a voice over of contestants sounding like they were going to a funeral? You are currently browsing the My husband cooks blog archives for June, 2008.